Tomatoes were my favorite food as a child, and my attachment to them has never really gone away. I look forward to them being in season all year long, and I celebrate their appearance more than any other summer produce. Unlike many vegetables, for which I’ll have a strong preparation preference (broccoli steamed; cauliflower roasted; spinach raw) I’ll take tomatoes raw, roasted, sautéed, or sauced. It’s all (so, so) good. Tomatoes are finally teeming at markets near me, and I’m gorging in the predictable summer fashion. There have been plenty of moments of cutting them up, sprinkling them with salt, and eating them with my hands from the cutting board before I even have a chance to sit down. 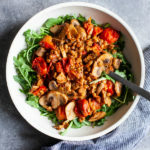 But sometimes I’m a little more dignified, and this warm lentil, tomato, and mushroom salad is my latest favorite thing to do with tomatoes if I’m patient enough to cook them. 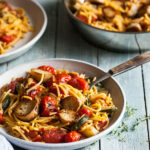 The nice thing about this recipe is that it’s great for summer, when tomatoes are at their best, but you can also substitute canned tomatoes in winter. Likewise, it’s wonderful hot, but the leftovers are excellent cold, which I learned today when I had them for lunch. 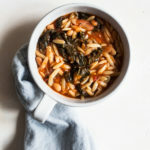 You can make it more or less hearty: I’ve been enjoying it at lunchtime with toasted sourdough, but it could be a filling dinner along with a soup, or you could even turn it into a topping for pasta or noodles, rather than greens. In other words, plenty of ways to adapt this one. And while I kept the seasoning super simple (garlic, balsamic, salt and pepper), you could throw in fresh herbs, a flavored vinegar, or even a pinch of harissa or crushed red pepper flakes for heat, if you like. Heat 1 tablespoon of the oil in a large skillet over medium heat. Add the mushrooms. Cook for 7-10 minutes, or until the mushrooms have released their juices and are tender and reduced in size, stirring frequently. Add the remaining teaspoon of olive oil, then add the tomatoes. Allow the tomatoes to cook in the pan for 3-4 minutes without stirring them (this will help them to brown gently and start to burst). Add the garlic and vinegar. Continue to cook everything, stirring every now and then, for a few minutes, or until the tomatoes are soupy and tender. Stir in the lentils and the vegan bacon or sausage, if using. Mix everything well and cook for another 2 minutes, or until the mixture is warmed through. Taste and add salt and freshly ground pepper as needed. Remove the mixture from heat. 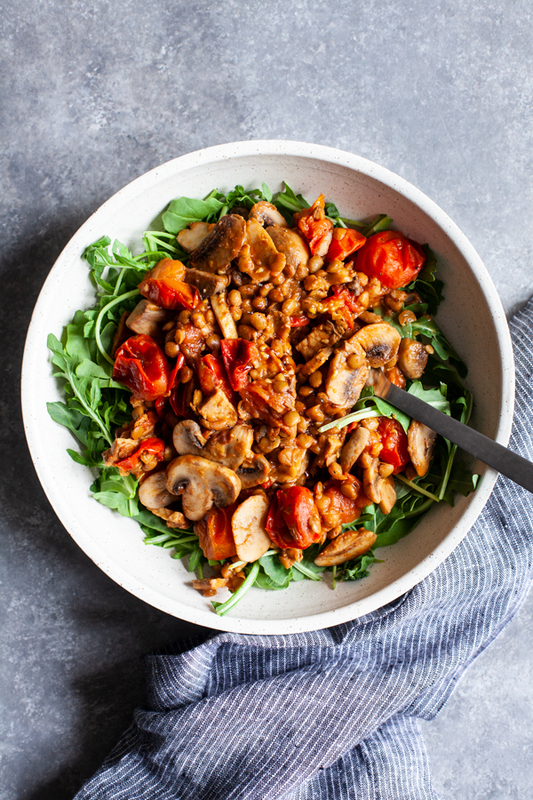 Serve over baby arugula, with an extra drizzle of balsamic if you like. You can also make it ahead of time, refrigerate it, and reheat or serve cold later. Enjoy. Leftover mixture will keep for up to 4 days in an airtight container in the fridge. 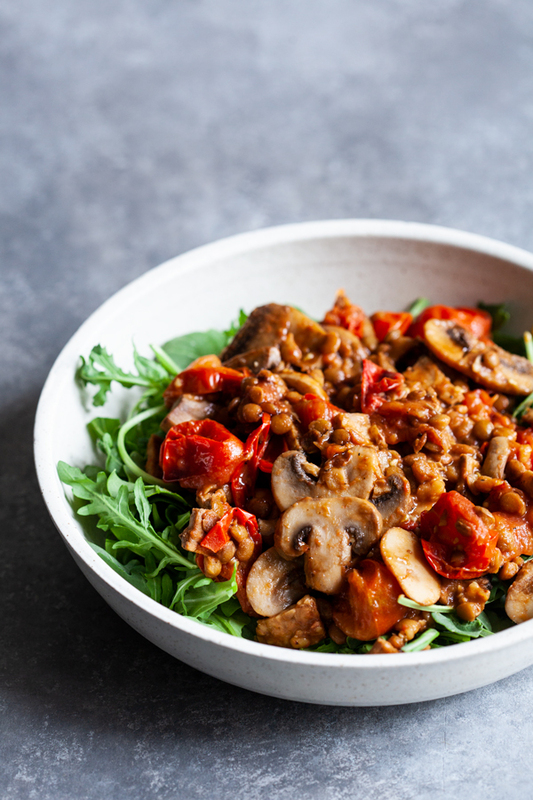 Store lentil/mushroom/tomato mixture separately from the arugula. *If fresh tomatoes aren't available, substitute 1 14.5-ounce can of diced tomatoes, drained. I know I’ll be enjoying this simple dish well into the fall, and I’m hoping it’s low-key enough to be one of the meals I can rely on once the DI begins. Fingers crossed—and fingers crossed that it might find its way into some of your kitchens, too. Before too long I’ll be back usual weekend reading thoughts. Till then, take care. This looks delicious and perfect for a summer dinner. Arugula is one of my favorite leafy greens. This is so colorful and pretty! I tried this dish today for lunch: DELICIOUS….!!! Thank you so much for sharing! I gobbled this up so fast! 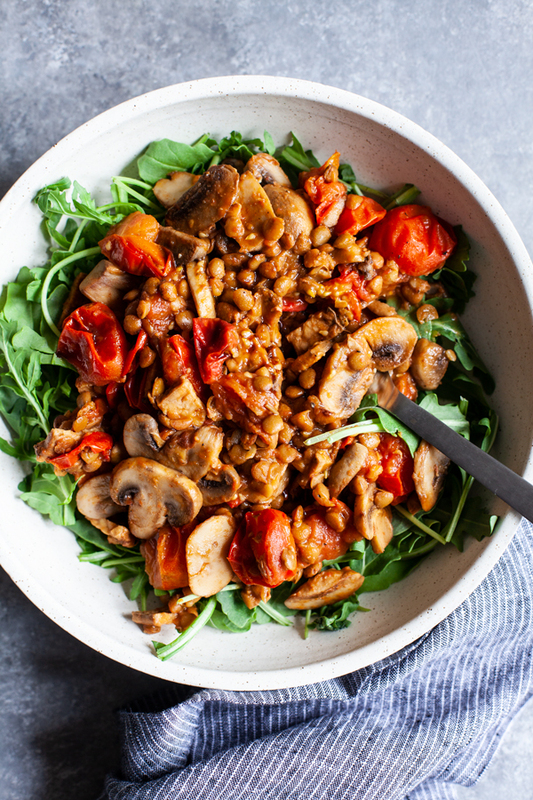 There’s something so lovely about the combo of mushrooms, tomatoes, and balsamic vinegar. 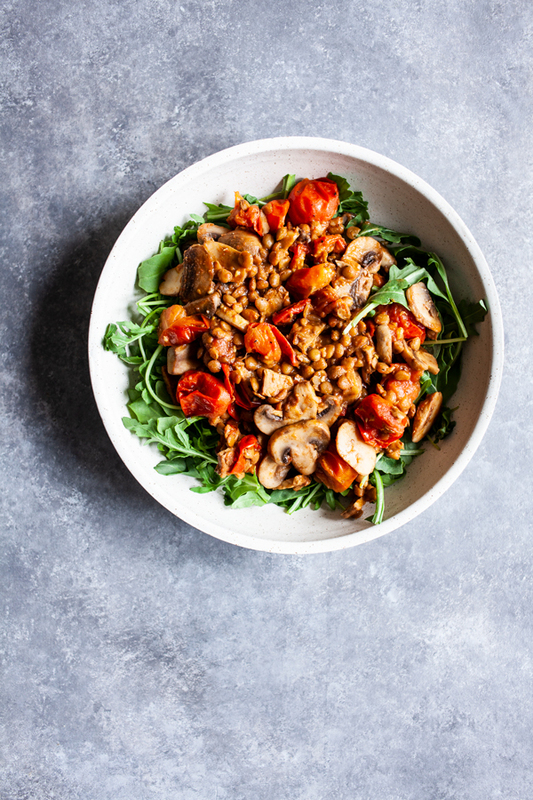 The lentils beefed it up and made it so filling and satisfying. I’ll absolutely make this again! I made this for dinner and it came out so delicious. I didn’t have any cherry tomatoes but a 14.5 oz can of diced tomatoes worked really well. I also threw in a little bit of leftover roasted garlic tomato sauce from a jar I opened last week. I had it over greens for dinner and put the leftovers on a pumpernickel bagel for a sloppy joe style sandwich for lunch today. This would be a great one for batch cooking/meal prep.